Vicki and Josh, who runs the website Localflux, were spotted interviewing citizens around town with cinematographer and Beacon resident Rob Featherstone. The interviews, about people’s thoughts on local radio, will be incorporated into a video that will be used in a soon-to-launch crowd-funding campaign on Indiegogo. The Ground is looking to raise $7,000 to help purchase equipment and pay for rent. Anyone hosting a show will also pay a small fee each month. The station plans to start out with four or five shows and grow from there. Who says video killed the radio star? The crew interviews Allyson Vermeulen of By a Thin Thread. The Ground will operate from space in Fovea Exhibitions, located on the west end of town at 143 Main Street. “We think a community radio project is a good complement to the work Fovea does promoting the educational value of photojournalism,” said Fovea’s co-director Stephanie Heimann. The video footage is now being edited, and the pair expect to have the fundraising campaign up some time in mid-May. Wigwam Media is excited to announce that it will be part of this community project and will be hosting a show on the station. We’ll have more about the show content and scheduling soon, but it will be available live streaming (the most fun) and on The Ground website as well as on this site. Stay tuned! 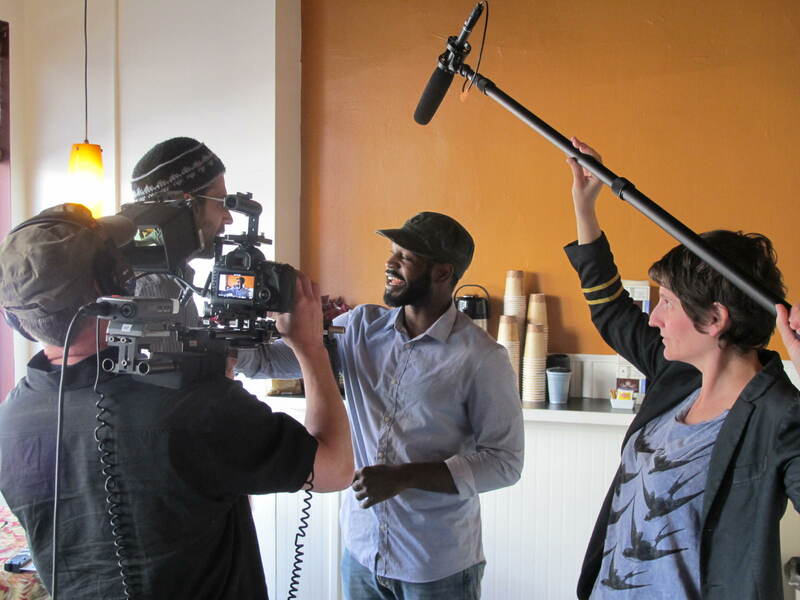 Feature photo: Camera man Rob Featherstone, boom mike operator Vicki Vergolina, and interviewer Josh Kogan talk to city council member Ali Muhammed about local radio for Beacon in the city’s newest coffee shop, Encore. This is very exciting! Do you all know about Wave Farm: http://wavefarm.org/? It’s an org dedicated to Transmission Arts based in Columbia County and they administer grants to media arts projects. Good luck!